It's called the Perfect Assignment because it was the ideal blend between fine art and a commercial assignment. View the stills and video. I shot the still campaign using a Canon 5D Mark II using a 85mm 1.2 lens. I used a Tiffen filter for a slight diffusion. Because she is such a high profile celebrity in Mexico the client thought it would be interesting to make a documentary, The Making of...a pre-production behind the scenes view of the making of the commercial. The total time from pre-production, shoot days, and post production were approx 2 weeks. All which were done in Mexico City. The following day, I went on to do my fine art project. After working in Mexico City for the commercial work, I was commissioned to do a Fine Art project...to travel all over Mexico to capture the spirit of the country and its people. The idea of the project was to show the how the people are devoted to family, religion, hard work and also the beauty of the country. 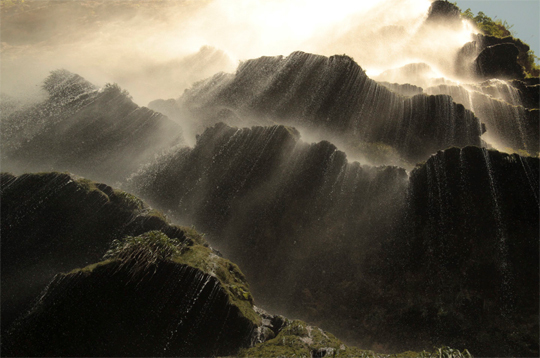 This culminated in a limited edition fine art portfolio & book called Our Mexico. It was envisioned by a Mexican dignitary as an important cultural project. Aside from this limited edition portfolio project, there are gallery exhibitions being organized for Mexico, North America and other countries around the world. This portfolio and book was presented as a gift and personally delivered to not only political dignitaries and heads of major corporations around the world but also to President Calderon of Mexico. View the images included in the book. The Red Silk wrapped portfolio box (18x24 inches, 46 x 61cm) which includes a collection of four limited edition prints, signed and numbered plus signed title page all printed on Somerset fine art archival paper. 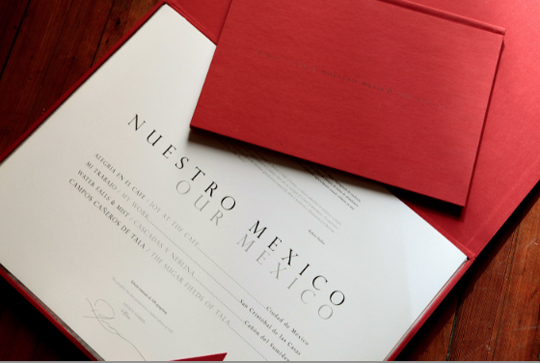 Also, in this portfolio box is a equally elegant silk wrapped book (12x18 inch, 30.5x46 cm) of Robert's photos on the theme, Our Mexico. Robert is shown signing the edition at the printers in NYC.